Baba Yaga was a thin, frail looking witch with sharp teeth and long dirty fingernails. She would wear jewelry made from the bones of various unfortunate creatures. Even though she was thin, old and sickly looking - she was very powerful. She was said to have the power to control people and animals to do her bidding. She could throw spells to paralyze individuals and then send some birds over to carry the soon to be feast back to her cabin. She could even control the weather. Her favorite meal was human flesh. Unfortunate passersby or lost travelers that came upon her eerie cabin in the deep woods would often end up in her oven as her next meal. She sometimes showed signs of mercy as in the story of Vasilisa, a young woman sent into the deep woods by her evil stepmother. Vasilisa fell pray to the woodland hag and was sent on difficult errands to gather ingredients for her potions. When she completed all the tasks, the old skinny witch gave the brave Vasilisa a magic skull that was capable of turning her evil stepmother into ashes. 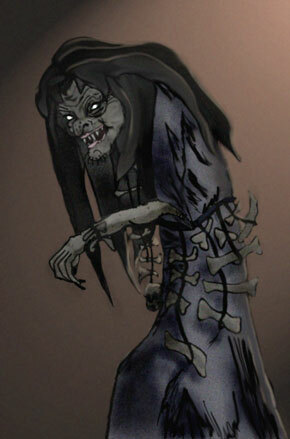 Above is our artists' rendition of this sickly, frail and evil little witch. Her hair is matted and clumpy due to her lack of personal hygiene. She is extremely skinny and frail looking but yet has the power to easily overcome her victims. Her complexion is sickly looking due to the fact that she feasts on human flesh. Her eyes are covered with cataracts but still manage to glow an evil stare. The jewelry, what's up with the jewelry? She definitely needs cooler looking bone jewelry. In the next picture - our artist will make sure she is better accessorized.